This book was everywhere and I love Patton Oswald and it’s really well written, I just couldn’t. It’s true crime, and true crime and I don’t mix – I’m too squeamish. Lord knows why, but I keep trying. I listened to half an episode of My Favorite Murderer before I nope-d right out of there. A full series podcast came out about a recent local crime and I don’t think I lasted five minutes. These are horrible things that actually happened to real people and it’s not that I think the genre is by default exploitative (although yeah it sometimes definitely is), it’s that I can’t engage with it without wanting to weep for the horror these people experienced. I can’t do it. All that said, I did make it halfway through this book. Per my Kindle, I was at exactly the 50% marker when I hit Part 2 and decided I couldn’t take any more. McNamara even went so easily on the horrific details and it felt like all the bad stuff might even be contained in Part 1 but there’s just so much anxiety in my life right now I didn’t need what I read in my spare time to contribute. McNamara is a very good writer and so extraordinarily driven in what really began as a hobby and I am blown away by her. I’ve been a big Patton Oswald fan for a couple of years and I can’t imagine his pain and I did jump to the back to read his afterward and ugh oh god the poor man. The book was also brilliantly edited together and just so good and yes I love knowing that the vile man who did all this is behind bars and it tears at me that she never saw it happen. This is for the true crime junkie in your life. There are a lot of them out there. This was not for me. Hell, I don’t even listen to Serial. Share the post "I couldn’t finish it"
I think the world needs more people like you! 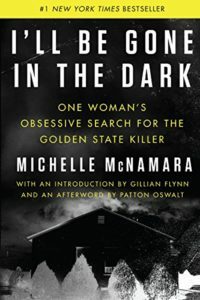 In fairness, I love true crime, I listen to crime podcasts, and I’ve read lots of true crime books, and this one scared even me.